This shorter version of our sleds is great for kids because of it is only 90 cm long, 54 cm wide and has a low center of gravity making it easier for small ones to pull by themselves. It can also be used by adults too and is great for small trips when you don’t need to carry much with you. 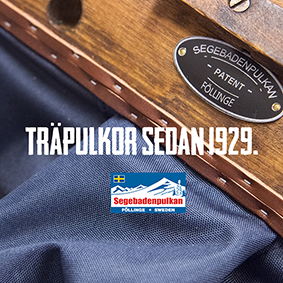 Built using Segebaden’s traditional methods and we even use the same tools that were used all those years ago. We manufacture three different models that you can choose from. We have two types of Canopys, one that we call the standard and one that we call the children's. To pull a sled, you need to skakel and a traction device, we offer 3 different traction devices ranging from the simple body harness and our own specially developed Belt Line which has a quiet shockline bracket which attaches to the Advanced Flinta backpack from Klättermusen which has been exclusively developed for Segebaden sleds. You can also choose to have backrests and sit/sleeping mats made from merino wool. 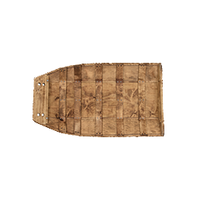 We give a 25 year guarantee on the wooden parts of the sled. Brass runners (3x) Plastic runner (2x one on each side and one brassrunner in the middle).